The location of this (temporary ‘waymarked’) geocache based on Stirling University’s campus was chosen because a Great Spotted Woodpecker has been seen and heard in the area. 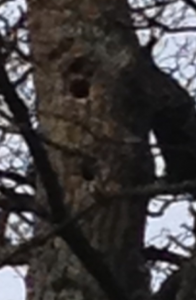 The woodpecker has made a home in a nearby tree making the activities place-responsive. This area is easily accessible for children because there is plenty of wooded area for them to explore, creating bird feeders and locating new places for the woodpeckers to visit. The contents of the cache were chosen to encourage children to engage with the task though active learning. The initial activity invites children to understand the sound of the woodpecker and the way in which sound travels, whilst allowing them to discover the layout of the woodland through a fun and interactive game. 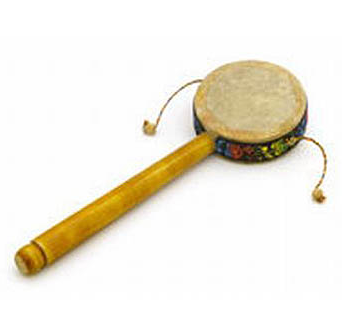 Using the claves and whirling drum provided, children hide in the wooded area making the drumming sound of the woodpecker whilst the remaining children seek the ‘woodpecker’ and identify where the sound originated from. 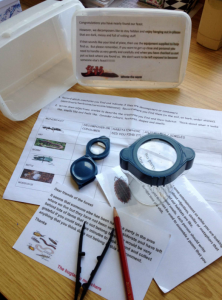 The second activity allows children to look at the environment through binoculars which allow them to highlight details of the animal and plant species, whilst investigating the location of the woodpecker’s natural habitat. This activity also allows children to discuss why they think the woodpecker chooses to make its home in these locations, e.g. higher in the tree to keep away from predators and potentially more dead wood closer to the top of the tree. The children are asked specifically to try and identify a nearby tree whereby the woodpecker has made nests in subsequent years. Can you see the nest holes below? It is amazing that the woodpecker can create a nest hole in such hard wood – this solid oak. 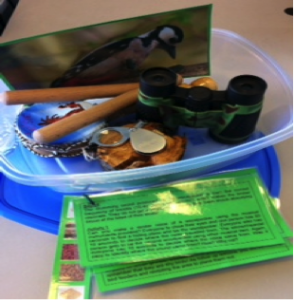 The third activity provides children with information on the woodpeckers’ behaviours towards hunting for food. Children are asked to discuss the food chain, discovering ways in which the population of the woodpecker can be increased in a specific area, such as through feeding and reproduction. Recent research papers can subsequently provide discussion opportunities as follow up lessons identifying these aspects and encourages learning for sustainability. Each of the activities encourages discussion and collaborative group work, allowing children to build on their confidence and self-esteem whilst working with their peers. 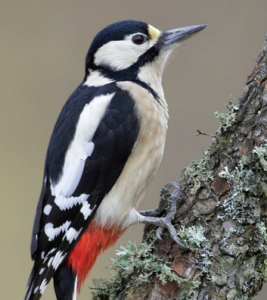 It also encourages discovering the importance of the natural habitat and feeding grounds for animals such as the Great Spotted Woodpecker. This geocache provides a basis for many opportunities for further inquiry-based learning both in and out of the classroom. 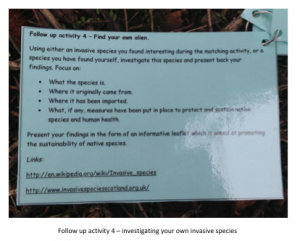 We have been exploring the use of place-responsive teaching strategies to promote learning about scientific concepts and sustainability through the use of geocaching. This activity is perhaps not place-essential – however it is place-sensitive to an outdoor environment – ideally, in a woodland area. 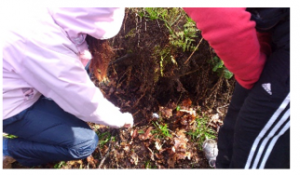 Our geocache contents provide a starter activity for soil as an important and finite resource, aimed as a motivational hook for children working at First Level. It was hidden, as the name suggests, under the soil remains of a fallen tree (see picture). 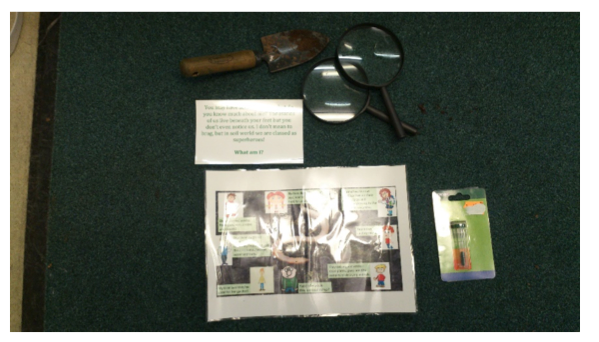 The finder is provided with a ‘Who Am I?’ riddle to, firstly, work out which organism they’ll be learning more about. 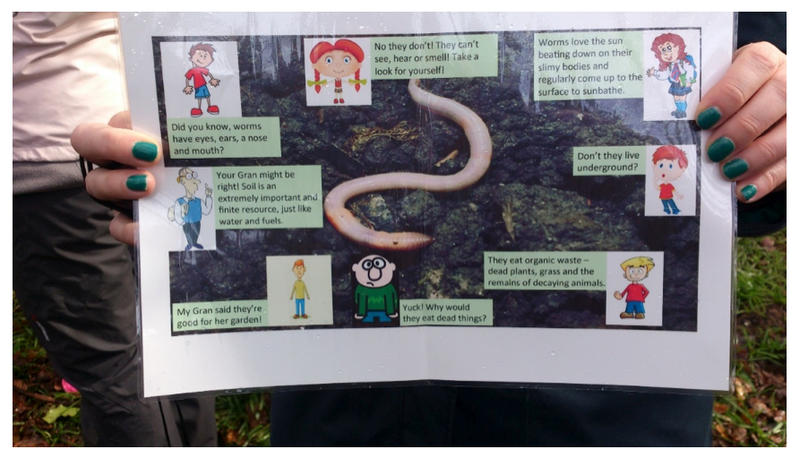 The finder will then be encouraged, through the use of the concept cartoon (below), to discuss facts and misconceptions about these superheroes of the soil, beginning with features of a worm itself. Tools such as a trowel and magnifying glass are provided to discover this creature for themselves so they can take a closer look. The concept cartoon progresses the discussion from features of worms to their role as indicators of soil quality. This activity provides opportunities for further investigation within a range of scientific concepts, including: decomposition, soil quality, nutrient cycling, indicator species and soil as a finite resource. In terms of outdoor management, small groups would be required to ensure all children are fully engaged and able to participate in the activity. Guidance should be sought to ensure children are not disturbing and destroying natural habitats. They should not dig in sensitive areas and should restore the site to its original form after investigation. Furthermore, worms should be handled with care. This cash design looks at the role of invasive species in woodland settings. 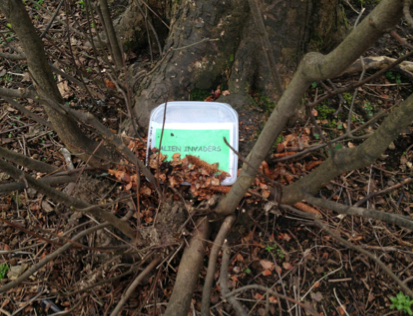 This temporary ‘way marked’ cache location was in a wooded area near Pathfoot building at the University of Stirling. There are several surrounding Spruce Pine trees in this area, making Grey Squrriels and half eaten pine cones a common sight. There is an open, somewhat flat area within this small piece of woodland which is ideal for carrying out the planned tasks and activities. In addition, this site is close to the Pathfoot building, which means there is a very short travel time to this site. 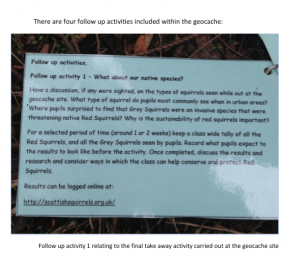 The final activity for this site, discussed below, asks children to record the number of Grey and Red Squirrels they see on the campus. This site’s closeness to the university building is intended to allow for this geocache to be visited early on in the pupil’s day of geocaching, allowing pupil’s adequate time to complete the final take away activity. 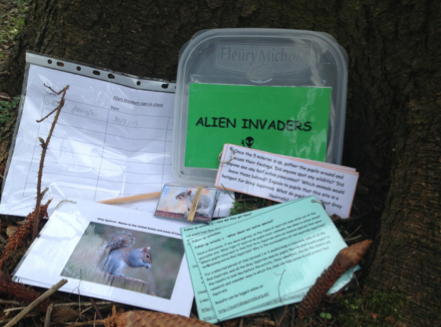 Ask pupils to look around the immediate area for wildlife, or signs of wildlife (ideally, pupils will either spot some Grey Squirrels or discover eaten pine cones). 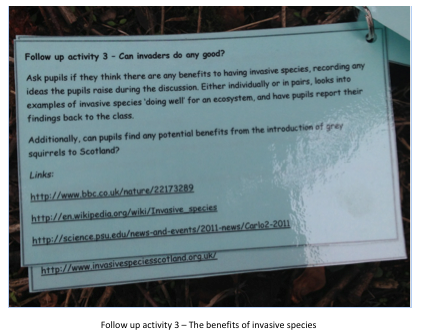 Once completed a discussion on what pupil’s know about Grey Squirrels can take place, followed by brief explanation of Grey Squirrels being an invasive species, what invasive species are, and how Red Squirrels are native species and suffering from the presence of Greys (all this information is on the cards). Next is the ‘alien invaders’ matching activity, where pupils will be given either a picture or fact and asked to find the matching pair. 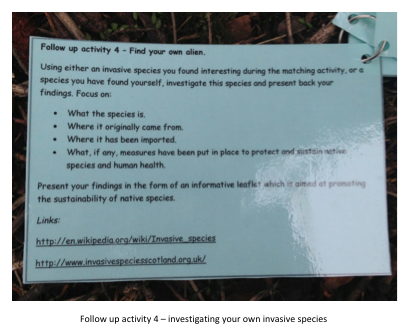 A follow up discussion on the matching activity can then take place, with each pair sharing the invasive species and related fact. The facts introduce the idea that invasive species are harmful to both humans and native species, and that invasive species can also be plants as well as animals. Finally, there pupils can keep a tally or record of all the Grey and Red Squirrels they see while travelling back to class or to other geocache sites. 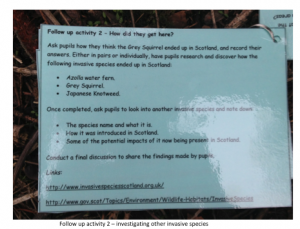 The Grey and Red Squirrel identification cards can be shown here so pupils know what to lookout for. This feeds into the first follow up activity (above & below). Potential issues with this site are that, at times, no Squirrels are visible. Commonly, Squirrels can be seen when getting to the site, but they soon run off and hide when people arrive. This could potentially mean that pupils do not see any Squirrels, which could spoil the pupil’s enjoyment of this geocache. 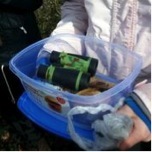 For this reason we feel it is vital that this site is visited early on during the pupil’s visit to the University Campus, to give them enough time to carrying out the take away activity and spot, record, and tally all the Red and Grey Squirrels possible. 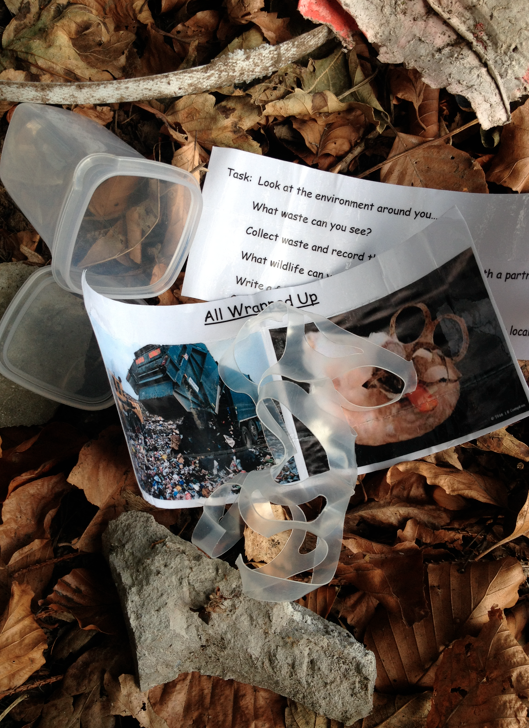 Geocaching and litter – CITO! In our project, local teachers and students of the university were charged with designing some new kinds of caches. 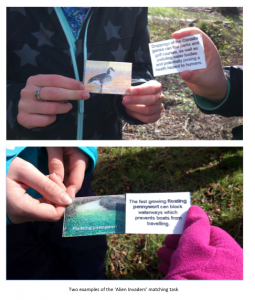 Our task was to design caches that would inspire the finder to engage in some form of inquiry in the setting where the cache was located and, by doing so to learn a bit about some scientific concept or process. In doing this, we hoped that geocaching could be made more responsive to the place in which caches are located whilst also enabling the geocachers to learn by doing in a fun and interesting way. In this cache (pictured above), the cache was cleverly embedded in a very large and very rotten log. 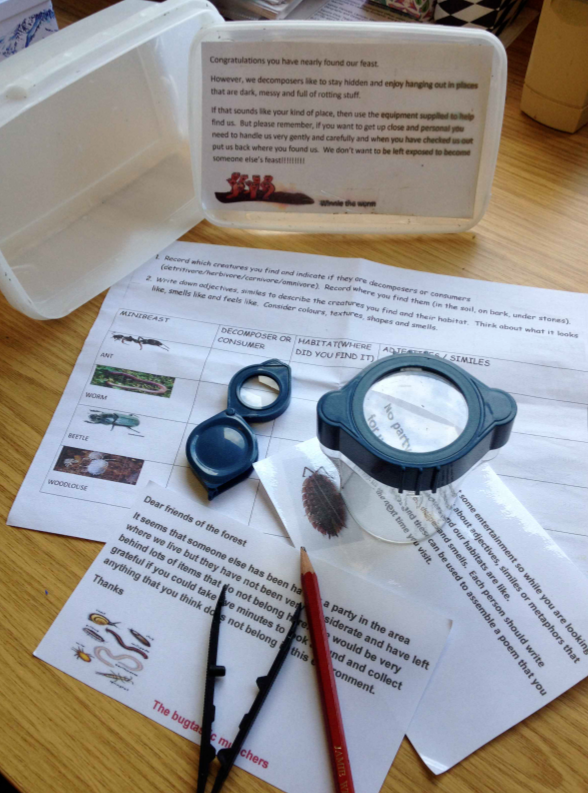 The finder was encouraged to go mini-beast hunting and to try to identify the critters with the inquiry tools provided. There was some basic i.d. information in there too in laminated form. Fun for all the family! There was also some information about how decomposers go about their work in the woods and a nudge to help us consider what we might do with all our own household waste. 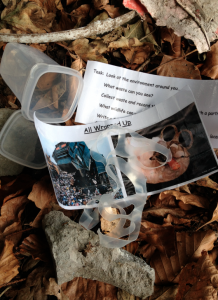 … so place-responsive science-based geocaching with a sustainability twist!